MOSCOW, January 19. /TASS/. 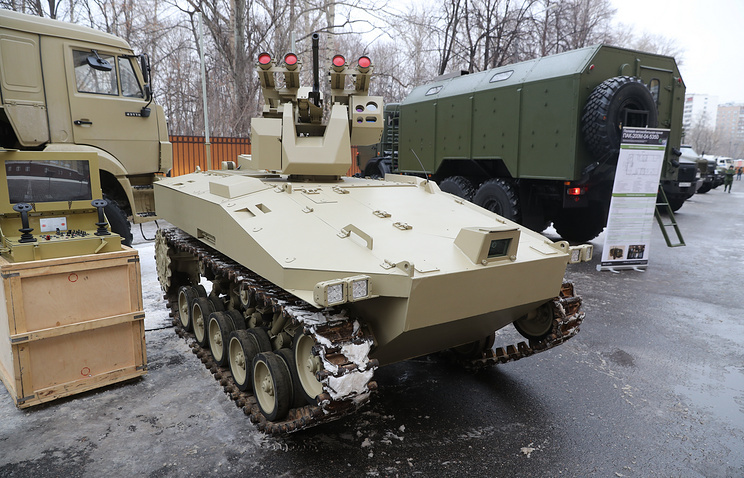 The Soratnik automated fighting vehicle has undergone trials in conditions close to a real combat at temperatures of over 30 degrees Celsius, the press office of the Kalashnikov defense manufacturer told TASS on Friday. A video posted by media outlets showed a Soratnik combat vehicle moving along the sea coast and firing weapons against targets. One of the videos posted on the YouTube says the Soratnik has been tested in Syria. "The Soratnik automated fighting vehicle has been tested in conditions maximally close to a real combat environment. These trials confirmed the vehicle’s characteristics and proved the possibility of using the robotic system at air temperatures of over 30 degrees Celsius," the Kalashnikov Group said. The scientific potential created in the process of developing the Soratnik robotic vehicle and the results of its trials will lay the basis for perspective robotized fighting systems, the defense manufacturer said. The Soratnik armored tracked vehicle is designed to conduct reconnaissance and transmit data, patrol and protect territories and important facilities, carry out mine clearance and clear obstacles. 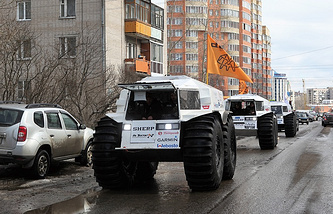 The Soratnik operates in three control modes and its weight does not exceed 7 tonnes. The robotic system can develop a speed of up to 40 km/h. The vehicle can operate within a radius of 10 km in a remote control mode and clear visibility. The vehicle’s tracked platform can carry 7.62 mm and 12.7 mm machine guns and also an AG-17A 30 mm grenade launcher. The combat module is furnished with a gun stabilizer and is capable of detecting, tracking and destroying targets on its own, determining their type. Besides, an option is envisaged to mount eight Kornet-EM anti-tank guided missiles on the Soratnik. As Kalashnikov Group CEO Alexei Krivoruchko said earlier, the robotic system can also operate in junction with unmanned aerial vehicles.